Hurricane season is upon us in Florida. Believe it or not, more people are seriously injured and killed on the picture perfect calm days after a hurricane has blown through and people are returning to their homes and lives. Here are 10 important steps to help ensure your safety in those crucial days following a hurricane. Hurricanes cause unbelievable destruction in terms of lost property and lives. However, it's a little known fact that many more people are seriously injured and killed on the picture perfect calm days after a hurricane has blown through and people are returning to their homes and lives. The number one culprit is stepping onto a wet lawn or puddle that is electrically charged by an unseen down power line. Following this tragic statistic, is the collapse of roof structures while examining damage and falling trees. Gulf Atlantic Industries of America, Inc. (GAI) is a state licensed and insured South Florida general contractor serving Miami to Melbourne and Miami to Pt. Charlotte. They specialize in disaster relief, new roofs, and hurricane protection products, including hurricane shutters, hurricane storm panels, and impact resistant replacement windows and doors. You may visit them at http://www.remodelsouthflorida.com or call (305) 937-0500. GAI offer's these 10 important steps to help ensure your safety upon returning to your home, high-rise, or place of business following a hurricane. 1. Have proof of residency in the form of a driver's license accompanied by a property tax document, insurance document, and or piece of mail that shows current address. This will be necessary to re-enter an evacuation zone or heavily damaged area. 5. Open up all your faucet's for 5-10 minutes to run water. Do not drink or bathe in water until you are given an all clear from the county or your municipality as water may be contaminated. Gulf Atlantic Industries of America, Inc. (GAI), a Miami, Florida general contractor, is proud to announce that they are an authorized participating contractor in "My Safe Florida Home". This is a State of Florida administered program designed to assist homeowners to better harden their homes and protect themselves and their families from treacherous windstorm damage. To learn more about this program visit mysafefloridahome.com. 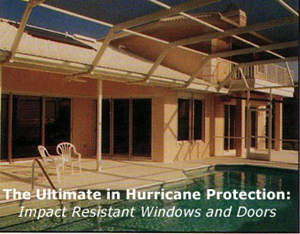 Besides hurricane protection products, see Gulf Atlantic Industries for your screen pool and patio enclosures needs.